Global Hotel Card Powered by EAN Hotels is valid for online hotel bookings at over 225,000 hotels worldwide at www.globalhotelcard.com only (not Expedia.com). The Hotel inventory on the website is supplied by EAN (Expedia Affiliate Network) a division within the Expedia, Inc. Group, one of the world’s largest travel companies, and trademarks are the property of EAN Worldwide, LLC and are used by license. 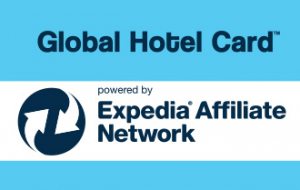 Global Hotel Cards do not expire. You may use up to four Global Hotel Cards per booking. There are no additional fees for booking and prices are the same as Expedia.com and the hotels branded websites. If the hotel reservation price is greater than the value of the Gift Card, the difference must be paid with a major credit card at the time of booking. If the reservation price is less than the value of the Gift Card, the remaining portion will remain and may be applied toward a future reservation. Cancellations may be made subject to booking terms. How to redeem Simply input the 19-digit card number and 4-digit PIN at checkout and the value on the card will be subtracted from the booking total.